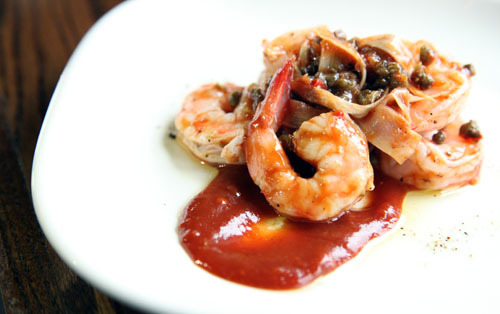 Chef Ron Eyester of Rosebud restaurant in Atlanta has a staple ketchup that he's been using in his kitchen for years. Lucky for us, he's decided to bottle it and sell it. With the help of Emily Myers of Emily G's, this Curry Ketchup can now be a staple in our own kitchens too. Ron originally developed the recipe to go with his scrumptious and popular eggplant chips. He describes the ketchup as having curry and clove flavors up front, which then mellows out into the ketchup flavor we all know and love. Recently, Ron was gracious enough to whip up some incredible dishes that highlight how the Curry Ketchup can be used. Em was there with me and after I took some pics, we quickly licked our plates clean. Ron uses San Marzano tomato paste as his base but there are a plethora of ingredients that he's added to give America's favorite condiment a modern, delicious twist. Yet, as with all of Ron's creations, there is nothing pretentious or intimidating with his approach. It's all about simple clean flavors. 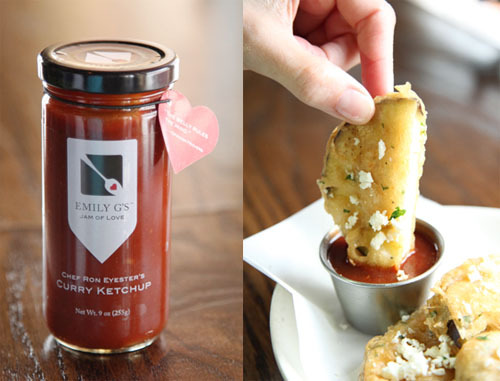 If you've tried an Emily G's jam or sauce, you know her concoctions are incredibly tasty and addictive. And I'm happy to report, her first collaboration with Chef Ron continues her knack of bottling ingredients that satiate and surprise. The newly launched Curry Ketchup is available online - but if you're in Atlanta, you can also find it at the Rosebud, Pine Street Market, Lucy's Market and Beehive Atlanta.